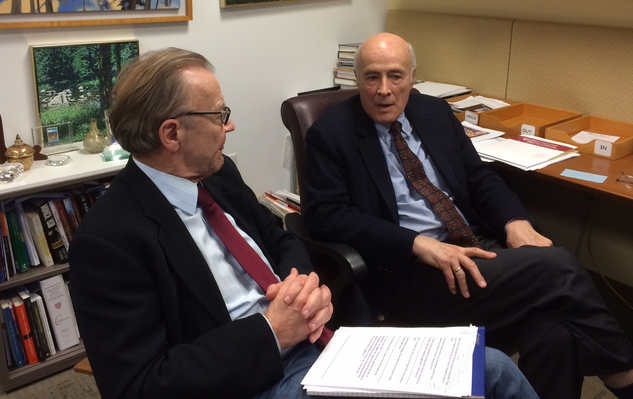 Professor Patterson interviewing Joseph Nye during his BGF Distinguished Lecture. On February 26, 2014 BGF was fortunate to have Joseph Nye, University Distinguished Service Professor at Harvard’s Kennedy School of Government and a member of BGF’s Board of Thinkers, participate in the most recent installment of the BGF Distinguished Lecture Series. Professor Nye’s Distinguished Lecture launched BGF’s Issue of the Year for 2014, which is U.S., Chinese, and Japanese relations. During his Distinguished Lecture, Professor Nye touched upon the numerous aspects of the relationship and perceived competition between the U.S. and China, China’s soft and hard power strategies, the tensions between China and it’s Southeast Asian neighbors, the importance of a triangular relationship between the U.S., China, and Japan, and the prospects for the future of U.S., Chinese, and Japanese relations. The video of Professor Nye’s BGF Distinguished Lecture, as well as a briefing on his lecture, can be viewed on the BGF website. The transcription of Professor Nye’s Distinguished Lecture is provided below. Nye: It’s nice to be with you all at this meeting of the Boston Global Forum. I’m Joe Nye and I’m going to talk to you a little bit about the relations of the U.S., China, and Japan to start a conversation. My colleague Tom Patterson is going to raise some questions that have been brought in before on the Internet, so I’ll spend part of the time outlining the problem and part of the time having a chance to answer your questions. Why focus on U.S., China, and Japan as a subject? Because it’s one of the issues which, if we mismanage, could make a real mess of our century. Some people have drawn analogies to 100 years ago. In 1914, Europe, which was at that time prosperous and had high degrees of economic interdependence, and where people were living quite good lives, Europe tore itself apart in World War I and ceased to be the center of world affairs as a result of WWI. And there is a danger, some people say, that the same thing could happen in terms of the relations between the U.S., China, and Japan. I don’t think that’s correct, but I’ll give you reasons why but, nonetheless, it is still an issue which has gotten a good deal of attention. There have been a number of books that have come out to commemorate the period after the end of the century anniversary of WWI which have brought forward this analogy to East Asia today. It was interesting that when Prime Minister Abe of Japan was at Davos at the World Economic Forum in January he raised the question of whether the relations between China, the U.S., and Japan were reminiscent of 1914. So, it’s I think a topic that’s worthy of our taking some time to think about. Now, if I look at the problems of U.S., Japan, and China today I think that we might start with the argument that the Obama Administration has talked about a policy shift to spend more time thinking about Asia. It was originally called a “pivot to Asia” but then it became known as a “rebalancing toward Asia”. One of the questions that people raise is: is that really an appropriate terminology? After all the United States never really left Asia. The United States is a country which, geographically, one of our states is in the middle of the Pacific Ocean and Guam is closer to the Asian mainland than it is to North America. In addition to that, the United States is very heavily economically interdependent with Asian countries. Another thing that’s interesting, given the nature of American foreign policy, is that our foreign policy is very heavily influenced by the origins of where Americans come from. Originally Americans came more from Europe, but increasingly you’re seeing the influence of Asian-Americans in American politics. So, for a variety of reasons, geographic, economic, social, I don’t think you could say that the United States ever left Asia, or ever will. Nonetheless, there was a feeling in the first 10 years of the 21st Century that we were not paying enough attention to Asia. We became deeply involved after the attacks on 9/11 in Afghanistan and then in the invasion of Iraq, we became bogged down in the war in Iraq, and I think there was a feeling by many Americans, and which is captured by President Obama, that we had spent a lot of the first decade of the 21st Century thinking about some of the most difficult parts of the world and we were ignoring or neglecting the area which had become the center, or was becoming the center, of the world economy. I wrote a book a couple of years ago called The Future of Power and in that I said that one of the important power shifts of the 21st Century was from west to east. It was a power shift in which, the best way to understand it would be to think historically back to the year 1800. In 1800, if you looked at the world’s population and the world’s product, what was made, you’d see that more than half was in Asia: more than half the world’s population, more than half the world’s product. If you fast-forward that to 1900, you’d notice that Asia was still more than half the world’s population but it was now only 20% of the world’s product. And I think what you’re seeing is a long-term process in the latter part of the 20th Century and in this century, is what you might call a return to normal proportions. I would expect that by the end of this century Asia will be again more than half the world’s product as well as more than half the world’s population. This, I think overall, is a good thing. This might be called, not the rise of Asia, but the recovery of Asia to normal proportions. I think, in that sense, what it means is that hundreds of millions of people have been raised out of poverty, and we should all be grateful for that. It means a reduction of misery in the world and it’s a great accomplishment. It really starts to some extent in Japan, carries forward to Korea, and to some of the Southeast Asian nations now very much focused on China, and increasingly, I think, will be focused on India. It’s a process which, I think, has been good for the world, good for Asians, but good for the rest of the world as well. But with that good news there are some people who say there may be bad news and the bad news argument goes something like this: Very often it is said that when you have a shift of power and the rise of a new power, right now much of the attention is focused on China, that this leads to instability and leads to the possibility of great conflict. This, of course, was the famous answer that the Greek historian Thucydides gave as to the origins of the Peloponnesian War, that it was caused by the rise in the power of Athens and the fear that created in Sparta, and many people transfer that to the origins of WWI that I mentioned a few minutes ago, arguing that it was caused by the rise in the power of Germany and the fear that created in Britain. And some are arguing that that will be the story of our century. That the rise in the power of China will create fear in the U.S. and in Japan, and that that could lead to another great conflict between countries. There are, as I say, some political scientists who say that this is the future. I don’t believe that, myself. I think that analogy is wrong for several reasons. One is that, if you look at the story of 1914, you should notice that the situation of Germany in 1914 was that it had already passed Britain. In that sense, not only would the causes of WWI be much more complex than just the rise of Germany, there was also the rise of Russia and the decline of Austria-Hungary, and so-forth. The most important thing is that Germany was not only right on Britain’s heels but, in some dimensions, was passing Britain and that was creating a degree of anxiety. When we look at the 21st Century, while there has been an impressive rise in the power of China, I think if we look at all dimensions of power, we do not see a China that is going to be more powerful than the U.S. for quite some time, if ever. How can I say that when everybody says of course China is going to be the bigger economy than the United States. Well, the reason I say it is that there are three dimensions of power: there is military power, there’s economic power, and there is what I’ve called soft power, the ability to get what you want through attraction and persuasion. Even when China, if it continues at it’s rapid growth rate and doesn’t face any bumps in the road to throw it off the road, even if China does become an overall larger economy than the United States in, let’s say, 10 or 15 years or so, that’s one aspect of economic power: the total size of the economy, which gives a certain amount of market power. But there is another aspect, which is the sophistication of the economy which is better judged by per capita product. And on that, on per capita income or per capita product, China, even when it becomes larger than the U.S. overall, won’t anything near the United States. Indeed, many economists say that if China continues to prosper and grow at the rate that it is now, it won’t be near the United States in per capita income until sometime in the middle of the century. That’s very different than, let’s say, the fact that Germany had passed Britain in industrial production by the year 1900, well before WWI. So, if we look at one of the dimensions of power, and we say “is China becoming more powerful than the U.S. economically?” Even when it has a larger economy, it won’t necessarily be more powerful than the U.S. in terms of per capita income, or overall economic power. The second dimension of power that I mentioned, military power, China has been increasing its military expenditures, indeed, with double-digit expenditures on its military budget in recent years. The military budget has been growing more rapidly than the economy overall. And some people say this means that China will challenge the U.S. as a global military power. But again, I think if one does a careful assessment of the numbers they’ll see that China has a long way to go in military power before it comes anywhere near the United States. China has indeed purchased and refurbished a former Ukrainian aircraft carrier, which forms it’s first carrier, and plans to build some more. But, there’s a large difference between having a single carrier, mostly now in a training role, and having, let’s say, a dozen or even anywhere more than 5, 6 carrier battle task forces. But carriers aren’t the only thing to think about. If you look at the ability to project military power globally, China does not have that capacity. The United States is probably the only country in the world that has a truly global capacity to project military power. So, I think as people say that China is going to equal the U.S. in military power, I rather doubt it, and even if some day it comes close, it’ll be quite some time to come. And then on the third dimension of power that I mentioned, soft power, the ability to get what your want through attraction or persuasion, China has been trying to increase its soft power. Indeed, in 2007, President Hu Jintao told the 17th Party Congress of the Chinese Communist Party that China needed to invest more in its soft power. And China’s been spending billions of dollars to do that. You have the establishment of hundreds of Confucius institutes and classrooms to teach Chinese culture and language around the world, you have the efforts to transform Chinese Central Television, Xinhua News Agency into global news agencies like the BBC or CNN. There are a number of efforts that China has been making to increase its soft power and that’s a very smart strategy for China. If you are a country who’s hard power, your economic and military power, is increasing rapidly there’s a danger that you’re going to frighten your neighbors and that they’re going to form coalitions against you. But if you can combine attractiveness or soft power with your hard power you’re less likely to produce these kinds of coalitions that would make you seem threatening, that would be trying to balance your power. So, in that sense, I think the strategy that Hu Jintao outlined in 2007 and which President Xi Jinping has reiterated for this year, is a smart power strategy of combining hard and soft power. The problem, I think, is whether China can implement that soft power strategy in the way it wants. And one of the difficulties there is a great deal of soft power from a country or from a society comes from its civil society. If you look at the United States, for example, a good deal of the soft power of the U.S. comes from its universities or from Hollywood and not from government actions. Very often government broadcasting, if it’s seen as propaganda, doesn’t really create much soft power. So the secret to creating soft power is to unleash your civil society, to allow the freedoms and encourage different groups to speak out, sometimes self-critically about the country, and that gives a degree of credibility which can emphasize the role and attractiveness of the society. The other point that I think China has to come to terms with as it tries to increase its soft power is the issue of how it appears in the eyes of its neighbors. If China has policies in which it appears to be bullying to its neighbors, for example, about issues in the South China Sea, that makes it difficult to increase its soft power. For example, when China had problems with the Philippines over the so-called Scarborough Shoal China was able to use the hard power of its naval vessels to prevent the Philippines from having access to the fish in that shoal but it meant that there was resentment that was created in Manila. So, the question that China would have to face is that if it follows a strategy of using hard power in the South China Sea to get what it wants, is that going to undercut its efforts to develop soft power through Confucius institutes and broadcasts and other things in national capitals. So, there is still a difficulty for China in terms of developing its full soft power resources. If you look at recent polls that have been taken by the BBC or by the Pew Trust and so-forth you’ll see that China is having some difficulty increasing its soft power, particularly among its neighbors in Asia. So, in that sense, I think the metaphor or the analogy in which people say that what’s going to happen in East Asia today is going to be like 1914 and there’s going to be a great conflict and that’s going to be caused by the rise in the power of China and the fear it creates in the United States, I think that’s greatly exaggerated. China is not in comparison to the U.S. where Germany was in comparison the Britain in 1914. So, that means that, in fact, there is much more time for the United States and China to manage their relationship. There is so much to be gained through cooperation in the U.S.-China relationship that the competition, which is bound to be there, doesn’t have to be the dominant strand of the relationship. If you think of the areas where China and the U.S. need to cooperate, for example, areas of climate change, areas of maintaining international monetary stability, areas like making sure that there are no global pandemics, these are things which can have extraordinarily powerful effects on all societies, America, China, and others but they can’t be solved by any country alone. These are not issues, these transnational issues, are not ones that can be managed by just having one country dictate to another; they have to be solved by cooperation. So, for those reasons, first of all I don’t think China is passing the United States in overall power, and second, that there are great incentives for cooperation in the relationship, as well as the competition. I don’t think that these predictions that 2014 and after will be like 1914 are very adequate ways to think about it. Indeed, if you look at the American policy toward East Asia, and I was involved in this in the Clinton Administration in the 1990s, the general policy that was laid out in the Clinton period, and which has remained the American policy since there, has been to seek to integrate China into the world economy and to develop good relations between China and the U.S., and Japan and China so there is a triangle of good relations. In the 1990s, some people were arguing that, as China’s power was rising, the United States should try to contain China. My reaction, and other people in the Clinton Administration at the time, was that it would not be possible to contain China; that that Cold War terminology just didn’t make sense. First of all, China’s neighbors weren’t clear that they wanted to join an alliance to contain China. Secondly, if you did try to contain China, you would just cause resentment and you would essentially make for bad relations between China and the United States afterwards. So, the attitude that Clinton took was to say that we welcome China with an open hand and Clinton supported China’s joining the World Trade Organization. The United States allowed major trade with China, which was good for us and good for China, but certainly wasn’t anything like containment in the Cold War. The other thing, of course, is we have many, many Chinese students, 200,000 I think in the United States now. That again is very different from the Cold War containment where with the Soviet Union there were almost no such contacts. So, the attitude that Clinton took was to invite China to participate, to be a responsible power. Now, some people said: “yes, but suppose China does grow strong and becomes a bully? Then what do we do?” And the answer there was to say, if China becomes a bully then others are going to want to be protected from China. In that period, as the United States looked at the situation we said, let’s integrate China into the world economy but as an insurance policy, where we want to hedge our bets, lets make sure that we keep good relations with other countries and particularly we reaffirmed the U.S.-Japan security treaty and security alliance. Both Japan and the United States had asked: “how do we deal with this rise of China?” China, of course, was on its way to passing Japan from being the third to the second largest economy in the world. So Japan had to think about security, the U.S. had to think about security and at the same time we didn’t want to contain China, we wanted to integrate China. So, by reaffirming the U.S.-Japan security treaty and treating the U.S.-Japan alliance as a framework for stability, we were able to accomplish, in policy terms, integration plus an insurance policy in case things went wrong. It’s best illustrated, perhaps, by the fact that I remember being at a summit meeting in which President Clinton met President Jiang Zemin in 1995 and Jiang Zemin asked Clinton: “Do you want a strong China or not?” And Clinton said to him: “We have much more to fear from a weak China than a strong China.” And that was an invitation, essentially, to China to be a full participant. At the same time, in 1996, Clinton and Prime Minister Hashimoto of Japan signed a declaration in Tokyo which said that the U.S.-Japan alliance, rather than being a relic of the Cold War, was the basis of a framework for stability in East Asia for the post-Cold War world. So, those two statements, those two attitudes of the ‘90s in the Clinton Administration were carried forward by the Bush Administration and then by the Obama Administration as the basis for how America saw this relationship. Basically that by having a triangle of good relations between the U.S., China, and Japan was the framework for stability which would allow the East Asian economies to continue to grow and prosper in ways that benefitted all three countries, China, Japan, and the United States. So, that basically has been the framework for the policy that the United States has tried to encourage in terms of the relations between China, Japan, and the U.S.
Having said this, that that’s the framework, what could go wrong? One of the things that could possibly go wrong, not that leaders would want a war, but that something could happen in terms of miscalculations. Let me give you some examples from the current dispute that exists between Japan and China over what China calls the Diaoyu Islands and what Japan calls the Senkaku Islands. This is about 7 or 8 square kilometers of barren rocks that are islets in the East China Sea. But what we’re finding is that there’s incursions of ships and planes, which are challenging each other. And there’s always a danger that somebody is going to make a mistake and that things will get out of hand. Let me give you an example of—well let me first give you a little history then an example of how this can happen. In 1972, when The United States handed back Okinawa to Japan after World War II, The United States had controlled the Senkaku Diaoyu Islands as part of its control of Okinawa after the war. And when it returned the territory of Okinawa to Japan it included the islands as a part of the handover. And in that sense, Japan has had administrative control because the Americans had administrative control of the Islands. But it was a problem, because in China’s view this did not mean that Japan had sovereignty over the islands and yet Japan felt it did have sovereignty over the islands. So when Japan and China were trying to normalize their relationship in the aftermath of World War II, then Prime Minister Kakuie Tanaka of Japan and Chou En-lai of China met, and they were arranging this normalization. And Tanaka said to Chou En-lai, “What should we do about these islands?—These little islands in the East China sea?” And Chou En-lai, I think, made a very wise decision here. He said, “Let’s leave this off for other generations. If we try to solve this now, we’re not going to be able to solve our issue of normalization. Let’s put it off for future generations.” That was wise, because essentially it meant that for decades to come while Chinese ships would sail into the area and sometimes would be challenged by the Japanese, basically there was no instant which disrupted the relationship between the countries. And as late as 2008, China and Japan were able to sign an agreement on how on principle they could jointly exploit any oil and gas, which would be found in disputed waters. But this came to an end in 2010. What happened in 2010 is a Chinese fishing trawler bashed into a Japanese coast guard boat, not once but twice. And the Japanese arrested ship, captain and crew. And when they took them back to Japan, the Chinese protested. The Japanese then released the crew but not the captain, who they said had been drunk, disorderly, and deliberately bashed into the ship. China took offense to that, “If we allow you to put this captain on trial, it means we’re accepting your sovereignty and your legal system. So we refuse that.” And eventually this led to a dispute, which escalated to the point where China embargoed its exports of rare earths to Japan, which is a very serious measure. And those exports stopped for a couple of months even after Japan decided to send the captain of the trawler back to China. The interesting point was that it had a negative effect on public opinion in both countries—increasing nationalism, increasing hostility toward the other country. That was the circumstance that was in place when in 2012, Prime Minister Noda of Japan at that time decided to purchase three of the islands—these little barren islands. And the reason he did that was that Governor Nishihara of Tokyo was going to use the money of the municipality of Tokyo to purchase the islands, and he going to do that to stir up trouble with China. So Prime Minister Noda basically was saying if the central government of Japan purchased the islands maybe we can prevent them being misused this way. China didn’t see it that way. China saw it as a disruption of the status quo by using government money, in their view, to nationalize the islands. And that led to anti-Japanese riots in China; to a decrease in trade between Japan and China in 2012. I was sent by Secretary of State Clinton at the time to talk to Chinese and Japanese leaders about the American interest here, which was to keep the situation calm and not to see this dispute escalate. A dispute between the second and third largest economies in the world would be bad for everybody. What I was impressed with as we met the leaders of China and Japan, was that they did not want war. They didn’t want this to escalate, but the question was could they avoid any miscalculations that would get out of hand in the future. And there is something to remember in terms of, not only, the incident in 2010, where the trawler captain bashing into the Japanese coast guard ship was not something ordered by Beijing, but something, which once it happened in a climate of nationals, it became difficult to manage. But if you go back to the case where the analogy with 1914 might make some sense. Sometimes statesmen wind up being trapped by events, which are more or less accidents or miscalculations. And things then escalate beyond where you’d like them to be. So if you look at the situation in 1914, there’s a lot of economy interdependence between Germany and Britain and other European countries. But nobody would’ve predicted by the beginning of the year there would be a war. And the only country that wanted war was Austria, but the war that Austria wanted was a short war in the Balkans, which you might call it the third Balkan War. Of course, the net result of one event leading to another following after the assassination of an Austrian Arch Duke Sarajevo was that you had a four-year war, which killed 20 million people, and which led to the end of Europe being the center of world politics. So miscalculations sometimes occur in human history. And if I look at the situation in East Asia today, the relations of U.S., Japan and China, I don’t think that’s going to happen. I think, in fact, there are strong enough interests, and strong enough interdependence between the three countries that war is not likely. But as we know, humans are fallible, human systems are fallible, and sometimes through miscalculations, we wind up in places where nobody initially intended to be. So I would summarize this description of the situation of the relations of U.S., China and Japan and East Asia today as one where in fact there’s a lot to be gained from cooperation. There are some dangers of miscalculations. I don’t expect that they’ll get out of hand. But unless we pay careful attention, there’s always risk of being taken by surprise. And that’s why on this 100th anniversary it is worth our attention to making sure we approve communications, avoid the dangers of letting nationalism get so strong that if a miscalculation occurs, political leaders feel their hands are tied. And that I think would be the moral of the story of what I’m talking about now, which is not that this is going to be a problem like the earlier conflict of the sort, but that unless we’re alert to some of the dangers of miscalculation we might wind up with a situation that nobody wants. So those are my thoughts on the relationship of the three countries, why it’s important. Let me just say one word and concluding about other ways to get out of this. I’m thinking particularly now the Daioyu Senkaku Islands situation. I’ve written in a number of places and spoken, one way to do this would be for Japan—ideally for Japan and China, but I don’t think China would agree at this point—to declare the Senkaku Daioyu islands a marine ecological preserve, which would have no habitation, no military uses, and which would be devoted to the larger good of the area as a whole. No one would have to agree that this would a change of sovereignty of the islands. You could leave that issue for the future. And in that sense, what we should be looking for is to revive the wisdom of Chou En-lai and Kakuie Tanaka, which is to put this off for future generations. Or another way to think about it is if we have a pot on the front of the stove, which is threatening to boil over, we are going to find some formula like this marine ecological preserve to slide it to the back of the stove where it will merely simmer for, lets hope, for another four or five decades as it did after Chou En-lai and Tanaka made their wise decision in 1972. So those are my thoughts and let me just see if I can answer some of your questions. It’s my colleague and friend, Tom Patterson. Tom Patterson: Hey, Joe. Thank you. Thanks for the wonderful remarks. I’m Tom Patterson. I’m a colleague of Joe here at the Harvard Kennedy School and one of the co-founders of the Boston Global Forum. And since the forum announced your talk, Joe, we’ve had dozens of questions for you that have come to us through the Internet and I’d like to ask you about some of them. Before I do that I’d like to ask you about one of my own. You talked about how China’s soft power is handicapped by its weak civil society. On the other hand, China has an enviable technology. It’s got money that we would love to have—we wish our fiscal health was China’s—and it’s using some of that money to spread its influence. We certainly did that after the second war. It was the main instrument of our soft power, the Marshall Plan a big and obvious example. And China is following that path in some ways. Yet in some parts of the world, it’s getting some resistance. We saw that with Myanmar, for example, and certainly some in Vietnam, and there are some suspicions of what Chia’s motives might be. How well do you think China is doing in using money as an instrument to soft power? Joseph Nye: Well, China has a quite effective aid program in Africa and Latin America, which I think has increased its attractiveness in its soft power. It’s been less successful in its immediate region of Southeast Asia, or its relations with India, for example. Partly because of this issue of whether it appears threatening at the same time. If China wanted to be more successful in using its money in its own neighborhood, so to speak, it will have to figure out how to combine its hard power and soft power more effectively—what I call smart power, the ability to combine the two so that one doesn’t cancel the other out. But if you look at the public opinion polls that they’ve taken, the global public opinion polls, China does quite well in Africa, Latin America; less well in its own neighborhood, less well in Europe. Joe Nye: Well when we look back at the 1930s and how Japan treated its neighbors—China and Korea—it’s pretty awful. And I think that one of the important things is that Japan has to come to terms with the ‘30s and you do have that in something like the apology that Prime Minister [name inaudible] made in the 1990s or the statement that Chief Cabinet Minister Kono made in apologizing for the comfort women in Korea. And I think the danger is that there are some groups in Japan now who are saying, “We are tired of apologizing.” And I think the recent threats of reversing those statements would be very, very bad. Similarly the Japanese Prime Minister Abe’s visit to the Yasakuni Shrine, which honors war dead from all wars and ages, but nonetheless 14 classic war criminals from WWII, that’s very offensive to both China and Korea and I think it was unwise for the Prime Minister to visit the shrine. Indeed, the American government through Ambassador Kennedy expressed disappointment at the Japanese action. So we’ll have to hope that Japan maintains it’s apologies for a period which doesn’t represent Japan today. Japan today is not a militaristic society as it was in the ‘30s. And I think it’s important that the apologies of the ‘90s stay and stand in place. It is important that Japanese Prime Ministers not make people think back to the 1930s by visits to the Yasakuni Shrine. Tom Patterson: So this is a related question, actually. It comes to us from someone in Tokyo. It’s basically a question about what Japan can do to reach out more fully to China. Joe Nye: Well, I think fortunately the economic relations between Japan and China are good. There is a heavy relationship of trade. There are some students, Japanese students in China, and Chinese students in Japan. Those are far steps in the right direction. But if you can find some large gesture which would indicate that Japan was willing to take like the one I mentioned of declaring that the Senkaku’s would be a green ecological preserve, that would be a way of demonstrating that Japan really is a peaceful society today. It’s not your 1930s Japan. And so Japanese officials ought to be thinking of ways that they can demonstrate Japan’s peaceful intentions, not merely through exchanges, which are a good thing, but through seeing if there is some larger gesture, which can indicate this. Tom Patterson: We have an Australian journalist who wrote to us on the topic you addressed, but on a dimension you didn’t talk about. He refers to the U.S. pivot to Asia. But he is wondering where in that pivot the Trans Pacific Partnership, the trade agreement that is being negotiated and is having some problems in Washington and at the negotiations table, where that sort of fits into this triangular relationship between China, Japan, and the United States. Joe Nye: Well, TPP (Trans Pacific Partnership) started actually with small countries in Asia and the idea was started by the Bush Administration. The idea was to set a higher standard for trade agreements. So China had been accepted into the World Trade Organization, the Doha Round wasn’t making very rapid progress. The feeling was suppose some smaller countries were able to agree on higher standards for trade agreements. And then that gradually grew. And you found Japan willing you join, you found Mexico and Canada, which are America’s NAFTA partners, being interested. So that now TPP would include about 40 percent of world trade, if it’s finally agreed upon and passed. At one point China said, “Well this is an anti-Chinese measure.” That it’s trying to contain China. And the China realized that: no, the Americans have said, in principle, if the Chinese can agree to the higher standards, China could join too. And so there has been some expression of interest in China as well. I don’t think this would happen right away, but if you ask over a longer-term future, it’s possible. It would be a very significant development. Tom Patterson: Well there was even some talk this week about the next meetings taking place in China. That would speak to that point. Now, here’s a question that comes from a Vietnamese national, talking about that part of Asia. What role can the ASEAN countries play in the relationship between the 3 big powers? Joe Nye: Well I think the ASEAN countries have been very successful by creating a degree of unity. Having these countries work together means that there is a sense of solidarity. They develop some soft power. And I think that if a country is being difficult towards one of these countries, the fact that it might offend all the other countries as well, means that there is incentive for good behavior. In 2002, China talked about the idea of developing a code of conduct for the settlement disputes about the South China Sea. Unfortunately that wasn’t adequately developed. I think China would be wise to go back to that idea of working with ASEAN as a group to develop a code of conduct. China tends to want to work with each of the small countries independently on the grounds that a big country like China will have more leverage with one small country. In one sense that’s true, but in another sense it’s not for the reasons I said earlier, because it makes China look threatening. But if China were willing to deal with the ASEAN countries as a group, that would make China look less threatening and would enhance ASEAN’s soft power, but also China’s soft power. Developing soft power is not a zero-sum game. You can have an increase in soft power by both China and ASEAN, which is a win-win situation. Tom Patterson: We haven’t talked much about Korea. The next question is on that topic. Where does Korea fit in this relationship between Japan, China and the United States? Joe Nye: Well, Korea, of course, is one of the great success stories of this recovery of Asia. If you look at Korea in 1960, it had the same per capita income as Ghana. Today Korea is a member of the OECD, the Organization for Economic Cooperation and Development. It not only has had dramatic economic progress, but it’s also has had dramatic political progress. No longer an authoritarian country, but a country in which elections lead to real changes in government. So I think Korea is a great success story and is a model, which other countries in the future can look to as one hopeful path for the future. Unfortunately right now, the relations between Korea and Japan are not very good and partly goes to this issue of nationalism and the sense of resentment about threats that Japan might change statements like the Kono statement on comfort women or things like the visit to the Yasukuni Shrine. I think it would make a lot of sense for Korea and Japan to repair their relationship if for no other reason than the fact that both of them have to ask what happens if something goes wrong in North Korea. And given the instability, the unpredictability of the North Korean regime the bad relations between Japan and South Korea is not something that either of them can afford. Tom Patterson: One last question and fittingly, perhaps, it’s from a Kennedy School Student. Better get this one right. It is said that China’s foreign policy reflects what it’s trying to achieve in its internal affairs. Does that insight provide any leverage in thinking about what China is likely to do in the specific region? Joe Nye: I think it does help. If China were an aggressive country trying to take over other countries—remember, going back to this 1914 analogy: Germany was seeking colonies in Africa, so forth—If China were focused outside then one might be more worried. But China’s major concern now is economic development. And they regard economic development as essential, not only because despite their impressive progress large parts of the countries are still very underdeveloped, the south, the west and so forth, but they’re concerned about keeping the legitimacy of the communist party rule. And the legitimacy of the communist party rule has largely profited from this very high rate of economic development. So a loss of economic development, or a failure in economic development would be very bad for China’s objectives. So in that sense, the fact that China is focused on internal conditions, economic development, and political stability, is a good thing. Now that doesn’t mean that China couldn’t make mistakes. As I’ve indicated in my talk, you could still have a foolish policy over some small, uninhabited island in the East China Sea or the South China Sea. But by and large, when my colleagues and I visited Beijing in 2012, what one of the top leaders said to us was, “We need 30 years of peace, and stability and economic development if we’re going to succeed.” That’s a hopeful sign. Tom Patterson: Joe, Thank you very much. On behalf of Boston Global Forum, this was the opening bell of a yearlong look of the relationship between China, Japan and the United States. That important relationship and what it might pertain not only for those three countries, but for the region and the world. As Governor Dukakis announced in his opening statements, we’ll be holding three conferences over the course of the year. And on our website, Bostonglobalforum.com, we’ll be posting materials related to this discussion and invite you to continue to provide us questions and we’ll do our best over the course of the year to try to address them. Thank you.